A glimpse of me: Fall Challenge 2011 - music maestro! Fall Challenge 2011 - music maestro! 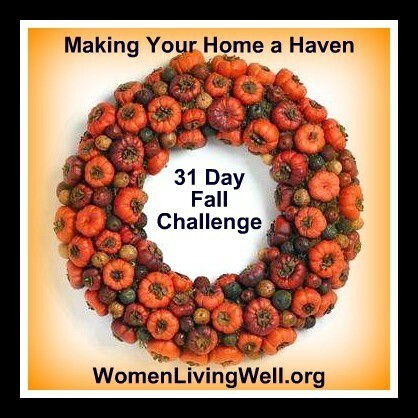 This second week of the Fall Challenge over at Women Living Well is all about music! Play soft music everyday in your home. Choose music that the family enjoys. Then, focus on using peaceful words and maintaining peaceful relationships. Role model gentleness with your words this week and while you’re add it have a little fun. Since the music is going, grab your husband or children and dance! I have been listening to soft piano music a lot already! I've started doing this last year during the same Fall Challenge... I love George Winston and David Nevue (I've discovered this last one over at Mrs Southern Bride!). Yesterday Jeff invited some of his friends to watch a soccer game (He just LOVES soccer!) so I went upstairs for some studying. There was a "little bit of noise" because the upstairs room isn't completely separated from our living room so at first I felt a bit cranky for them not being sensitive to the fact that I was studying! But then I thought "du-uh, they're watching soccer... I can't expect them to be quiet!" and I put on some beautiful music!! Tonight we'll be going to our first evening of a 8week marriage course! A dark red it will be! Please please please vertel mij waar in België je OPI nail polish kan kopen. Ik heb er al ongelooflijk veel over gelezen op Amerikaanse blogs & wil het zelf ook eens uitproberen. ;) Mooi kleurtje! Ik heb mij eergisteren een heel mooi nagellakkleurtje gekocht van Gosh. Zal er binnenkort een foto van posten. Ik kijk al uit naar je post over de marriage course!